Orchids are a large family of over 30,000 species that thrive in all climate zones except for the Arctic, the Antarctic and icy climate of high mountains. Epiphytes with or without stunted leaves and with long hanging and clinging air roots with green tips with chlorophyll essential for the assimilation. These tiny roots absorb moisture from the air and nutrients as well. Epiphytes with thick pulpy leaves adapted to reduction of loss of water and enhancement of photosynthesis. Can be green or only partially green. Epiphytes with pseudobulbs (special organs for sustaining water and nutrients that help the plant in surviving extended periods of drought. Bulbs are either small as beans or big as pumpkins. Round bulbs usually grow in pairs, thus reminding of testicles. Their name is derived from Greek word orchis, meaning testicles. Regions with moderate continental climate. Temperature span: winter below 0°C, summer above 30°C . Regions with tropical climate. Winter around 20°C, summer around 30°C. A lot of rain and high humidity throughout the year. Window shelf (above radiator is convenient) or any other bright place. Plastic or ceramic salver where redundant water from watering is kept. Some base to put the flowerpot on as it shouldn’t stand in the water. Name and origin of a sort. Some good spirit and regular watering and you shouldn’t fail! In case you are prone to forgetfulness we recommend the use of our Flower Servant as it will promptly remind you when to water or spray, fertilize or transplant your orchids. Domestic growing is not widely known due to deficient literature. 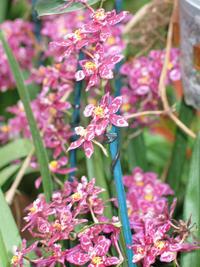 It is especially so with translated literature as the translators are only rarely people who grow orchids themselves. Thus terms as moderate watering, higher humidity, and normal temperature do not tell much to people who would like to grow orchids. It is essential to know exactly how much water and what temperature and climate condition the plants demand. It is very rare that such information is supplied in florists or garden centres. Take time and read the information we are giving carefully and only then decide for the plants you want to purchase. Make sure there is a label with the plant’s Latin name as this is the only way you will be able to find information about your orchid on our website. There is something very special about orchid hermaphrodite flowers, composed of 3 sepals and 3 petals. 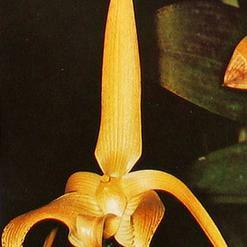 Labelum is of different colour then sepals and petals and gives distinctive appearance to orchid flower. 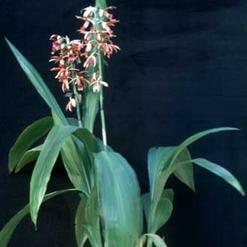 Best mode of multiplying is through partition of an older plant. We should leave upbringing from the seed to qualified horticulturists as a special fungus with which the orchid lives in symbiosis is demanded for germination of the seed. It is essential to preserve this symbiosis even later as hyphae of fungi are spread around the roots and other parts of the orchids. We have to be careful when transplanting orchids as to harm the root and ryzom system of the plant as little as possible. 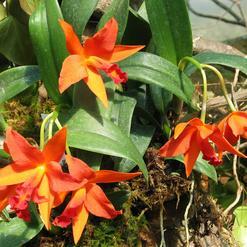 We should transplant orchids as soon as fresh roots appear. We remove old and dry roots. Young roots are extremely fragile and easily get injured or broken if touched when transplanting is done too late. 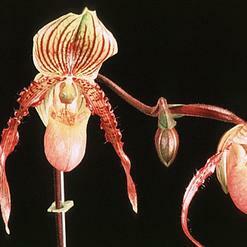 Such injuries result in temporary break in orchid’s growth or it can even terminate it. It is also essential not to pluck the underground bulbs. 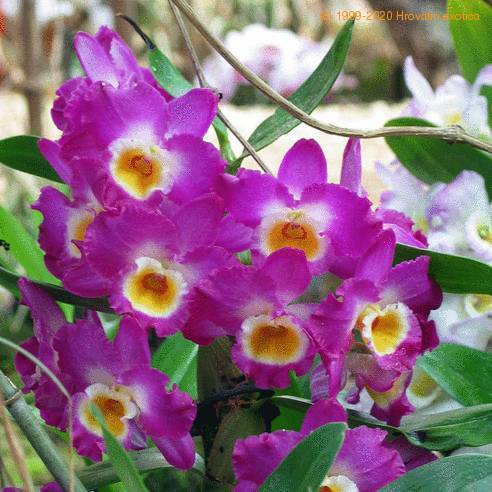 Orchids are very sensitive to direct sunlight and have to be kept in shady place during the summer. We can, however, keep them on direct sunlight on the shelf by the window during the winter from November until March. Imported orchids are sold in the flowerpots. We recommend transplanting into appropriate mixture of soil. We can also grow them in larger vessels, in hanging baskets or wrap their roots with moss and fix them to a piece of tree trunk with the wire. Water for watering and spraying should be stale, slightly sour (pH 5-6) and warm (20-25°C). 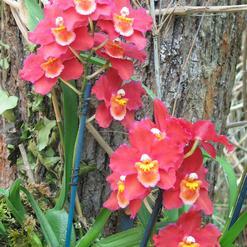 Leaved orchids do not need any period of rest and therefore need permanent warmth and damp soil. We water them less during the winter. 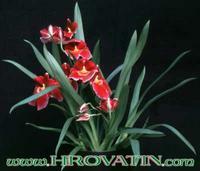 The sorts with pseudobulbs need the period of rest, therefore we should water them really modestly. They are sensitive to humidity and do not stand over watering. The period of rest coincides with our winter season. We start watering when first buds appear. 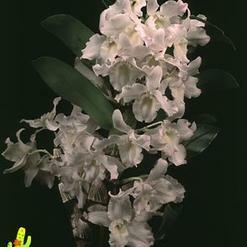 It is impossible to grow some sorts of orchids at home, especially where high humidity is needed (orchids that originate in tropical and tropical highland regions). We can, however, grow them in separate glazed space (orchidarium) that is equipped with all the facilities to provide tropical conditions.